I love spring because that means summer is right around the corner and I prefer warm weather to cold. Go figure that I call the Midwest my home because our spring and summer are not as long as much of the rest of the country. None the less I love the warm weather I do get and one of my favorite things growing up was once the weather was nice was getting to go to ladies lunch. My mom would take me and my sister to a little cafe and we would get finger sandwiches, I would always trade my tuna fish one for my mom's cheese one, and there were always scones and lemon curd. 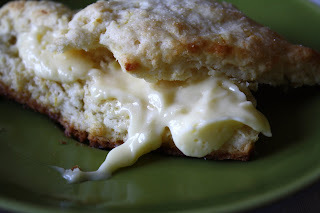 So when I think of spring I think of scones and lemon curd, even though back then I wouldn't go near lemon curd at all. I had texture issues with food growing up, heck I still do who am I kidding. So I thought the two would be a perfect start to spring. And why only have one lemon element when you can have two so Lemon Scones and Lemon Curd it is. Preheat oven to 425 and line a baking sheet with parchment paper. In a bowl combine the flour, sugar, baking powder, salt, and lemon zest. Add in the cubed butter and stir to coat the butter with flour. Using a pastry blender cut into the butter until they become the size of small peas. Add in the heavy cream and lemon juice stir to combine. Once it starts to come together into a dough, turn it out onto a floured board and knead it a few times until it completely comes together. Pat the dough into a circle that is about 1 inch thick and cut as desired. I used a big square cookie cutter and then sliced them in half to get nice triangles, but they can be made into any shape. Sprinkle with sugar and bake for 14 to 16 minutes or until they are light golden brown. Cool on a wire rack and serve. These do not really keep that well so they are best served the same day. In a medium saucepan, combine juice and the first amount of sugar. Bring to a simmer. Combine eggs with the second amount of sugar. Temper the eggs with about half of the hot juice mixture and then return the mixture to the pan and continue to cook on a low heat until 165 degrees or until it start to get firm but not when its actually firm. Remove it from the heat and pour into a mixing bowl. Add butter when the mixture has cooled slightly and once most of the butter has been incorporated blend with an immersion blender until smooth but make sure you keep the blender submerged so that you don’t aerate the mixture. Then place in a plastic storage container with plastic wrap pressed against the top of the curd so it does not form a skin. This can be kept in the fridge for a few weeks. a lemon overload is fine by me. these are perfect! I bet they tasted crazy good. We love lemon anytime of the year but it tastes extra good in the Spring! Can't wait to try these! oh this is a lemon dose I need! Katieeeee - These sound SO good!!! 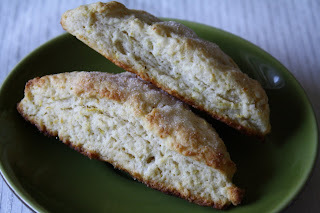 I love lemon scones, but I add some lavender to the dough as well. It brightens the lemon flavor w/out making it too tart; it's great! YUM! I can't wait to try this! However, how could I make it into teaspoon an tablespoons, the grams have messed me up! Thanks my mouth is watering in anticipation! Fabulous! I can't wait to try these! Wow, everything looks sooo good! Oh my gosh. Lemon scones with lemon curd? Sounds absolutely divine. Your ladies lunches sound so great; what fabulous memories these scones can bring back! Gina - it is about 2 cups and yes I meant 1 3/4 ounces of sugar. Which I think is about 1/4 cup. I hope you make these and enjoy! Can you really make Bread in 5 Minutes??? ?